All CSLL seed drawers are labeled by FAMILY. All plants with the same flower/reproductive structure are in the same family. Solanaceae (Nightshade) and Brassica (Broccoli) are examples. Learn more about Plant Names here and their importance in seed saving. 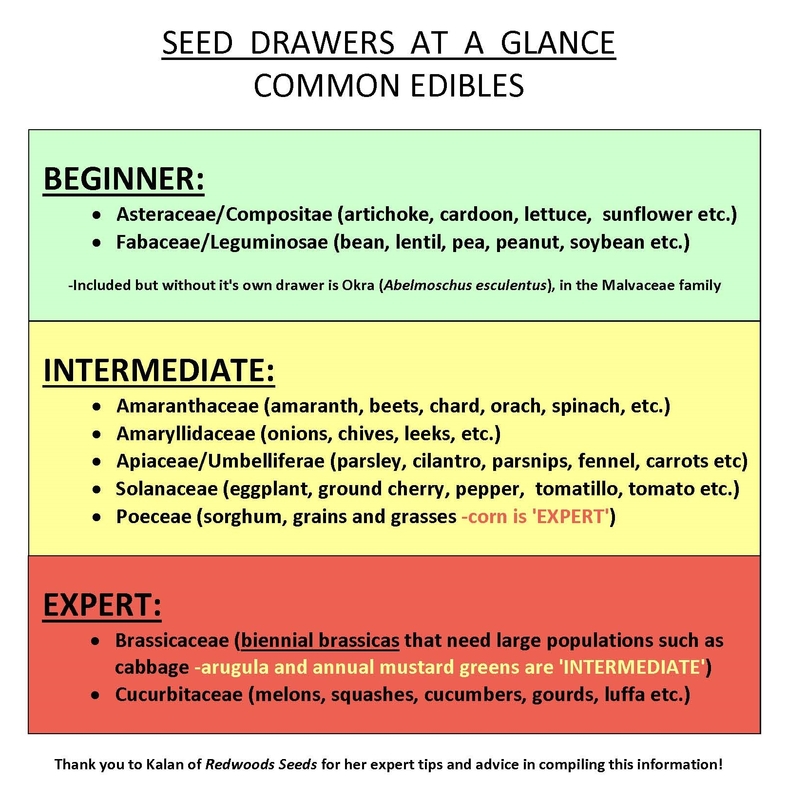 Read on below for our suggestions for seed saving. These crops are a great place to start and learn about saving seeds. Although there are extra measures a seed saver may take to ensure pure and viable seed, these are pretty reliable. Asteraceae/Compositae (lettuce, sunflower) Allow the plants to flower, collect dry seeds. Fabaceae/Leguminosae (bean, lentil, pea, peanut, soybean) Allow beans and peas to dry in their pods on plants before collecting and storing, but gather them before they shatter. These require a little extra work but are possible for someone new to seed-saving. Solanaceae (eggplant, ground cherry, pepper, tomatillo, tomato) Allow fruits to fully ripen. Seed must be separated from pulp (letting pulp ferment in water for a few days is helpful). Seed should be rinsed and dried thoroughly before being stored. In order to save good seeds from these plants, specialized knowledge and a fair amount of work are required. The plants may need hand pollination, tenting, or other methods to ensure varietal purity. These families will readily cross with unseen nearby plants and may create odd, possibly inedible varieties in one generation. Brassicaceae (broccoli, kale, cabbage, cauliflower, turnips, brussels sprouts, collards, radish, etc. -arugula and annual mustard greens are ‘Intermediate’) Biennial brassicas need large populations such as cabbage.